Get FREE premium subscription to MTV Trax and a massive 7GB of data with the MTV TRAX SIM from EE. You’ll also get unlimited texts and 500 minutes on the UK’s fastest 4G network! MTV Trax delivers A-list playlists packed with all the music that matters. 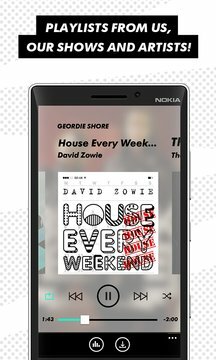 The biggest hits from MTV’s Top 30, Hot & New, hits you’ve heard on shows like Geordie Shore and Ex On The Beach plus new release albums, Club MTV, Workout, Party Playlists and daily themes. 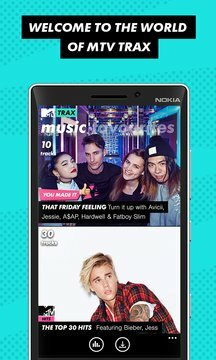 MTV Trax – set your life to music! We make it easy! Every day we deliver fresh tunes while you sleep – you just wake up and press play! There’s more! You don’t need to be connected to play your music. Always available to play offline, so no interruptions or big data bills as the music is loaded directly to your phone. Choose your favourites to create your own playlist; share what you’re loving listening to on Facebook and Twitter. In app now: MTV Trax Tour 2016, in association with Club MTV’s 'Pimp My Summer Ball’. Download now and get R3WIRE and VARSKI’s exclusive mixes!